Tamer El Said is a filmmaker living between Berlin and Cairo, his city of birth. He studied filmmaking and journalism before making documentaries and short films which began to receive international accolades. While teaching at the High Cinema Institute in Cairo, El Said took on the Senior Producer role for Nile Productions and Hot Spot Films in Dubai, producing more than 250 documentaries in 58 countries and winning several international awards. In 2007, he founded Zero Production to produce independent films. As a passionate advocate for the power of cinema, El Said also founded the Cimatheque–Alternative Film Centre in Egypt, a multipurpose teaching and programming space for the independent filmmaking community. Internationally, he runs mentoring workshops in film and art institutions, including the Institute of Contemporary Art in London, the School of the Art Institute in Chicago, and Silent Green in Berlin. In the Last Days of the City is El Said’s first feature film as director. 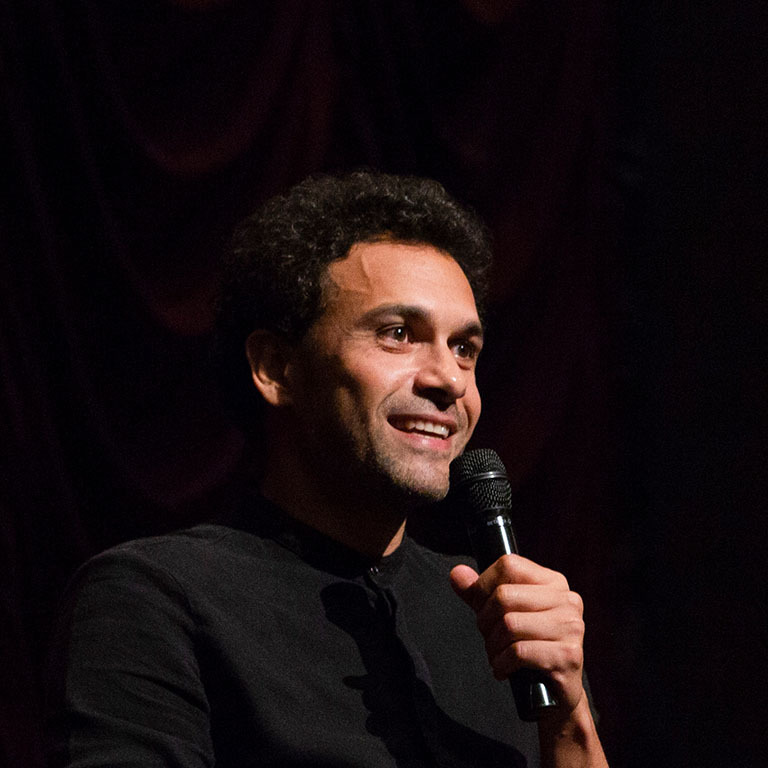 Tamer El Said on stage with Jon Vickers during his Jorgensen Guest Filmmaker program. Tamer El Said signs the poster for his film In the Last Days of the City. Tamer El Said and Jon Vickers stand in front of the Indiana University Cinema.